He was born in Wilna (or Vilna), Poland, February 29, 1832, the son of Simón Chodasiewicz and Filipina Ravené, a family descendant from the count of Habdang. That year, his father, who had participated in an insurrection against Czar Nicholas I in 1931, in trying to obtain freedom for Poland, was confined by the authorities. Under those circumstances, he obtained work as the administrator of an agricultural colony in the neighborhood of Staraia, (Department of Novogorod), under the condition that his male children, from 9 to 11 years of age, would enter Military School. This adverse circumstance for his mother country and his family was not such an obstacle to Simón Chodasiewicz who cultivated a familiar education founded on Polish traditions and his own love of his country. They preserved their language, (they spoke Russian before strangers), and always looked for the chance to maintain and to protect his compatriots in the same situation to almost protect them from the treatment vejatorio of the Russians. During 1853, Russia and Turkey entered into conflict for control over the Crimea (1853-1856); in this fight, for different reasons, France and Great Britain were also involved and on the 28th of March, 1854, declared war on Russia. Robert A. Chodasiewicz, with the rank of Lieutenant with troops control, was assigned to the Tarutino Regiment that was mobilized to the zone of conflict. There he performed missions of a scientific type and intelligence, dedicated primarily to the field of engineering (topographic improvements, defensive installations, etc). The nature of these activities was the one that with the accumulated military experience and the different particular tasks developed in compatible fields, acquired the title and specialization of engineer. The 20th of September of that year, he participated in the battle of Arroyo Alma with a shining performance, reason for which the "Order of San Vladamir" was granted to him. Soon, under the direction of German Engineer Todleben, between the 25th of September and the 3rd of November, he participated in the planning and construction of the fortifications of Sebastopol, which the French and English began to attack at the end of the 17th of October, 1854. He participated in the battle in the city of Balaklava where the fame of the Light Cavalry was initiated, under the command of Count de Cardigan, when he went to the center of the enemy position, in crease, charging against it and incurring an excessive number of casualities. The 5th of November, he fought in the battle of Inkerman, where Chodasiewicz was wounded by bayonet in the left hand during a enemy assault on his positions. By this action, he was promoted to the degree of Captain and commisioned to the village of Churgun to begin topografic improvements to the British fortifications in Balaklava. The conflict situation that encouraged in the town of Poland their added hopes of independence to insults to which he was the object from his Russian comrades for being native, they caused that the 25 of March of 1855 decided to move themselves against the enemy in that front (Balaklava). After crossing the battlefield at noon, appeared to Sir Colin Campbell, (Commander of the English troops stationed in the place). Initially he was suspected to be a spy he was stopped 10 days by the head of the British troops James Henry Somerest Fitzroy, later, Lord Raglan (1788-1855) and was assigned different technical missions. His extraordinary technical capacity enabled him to propose the formation of an intelligence unit. The Department of Secret Inteligence organized (Secret Intelligent Departament), to which an office of interpreters in charge of Mr. Jackson was added to him. After that, the Russians organized operations behind the lines, which allowed him, in addition, to spy on the military post office and to maintain correspondence with the assistant of the Russian Commander-in-Chief, Prince Gorchakoff. Also he carried out works that enabled him to blow powder magazines and laboratories of Sebastopol, to set fire to the storehouses of Bakchisarai (Police station of Bakchiropol). he was so the efficiency of the intelligence service organized by Chodasiewicz and the damages infringed that the prince put one he compensates of 10,000 rubles by his life and commissioned to Arvalid Captain so that being made happen like deserter, one infiltrated with the single object to assassinate him. He traveled to London using a passport under the name of Robert Hadasevich (or Hodasevich), the difference probably must to that in Polish, "ch" is pronounced as "ha". On July 26, 1956, he published a work entitled "La voz de los muros de Sebastopol" , ("The voice within the walls of Sebastolpol"), with stories of the war of Crimea and different plans of the battles of Alma, Inkerman and Sebastopol. The writing was translated by Jackson, his comrade of the office of translations. Durante 1856 he crossed Europe with the exception of Germany and Austria. With respect to those countries, Chodasiewicz had reservations that he might be arrested and delivered to Russia. He joined the Regiment of Dragoons and Cossacks composed of Poles who wore the traditional uniforms of that country, (they wore the fez instead of the classic helmets), when serving in Turkey. There he carried out assignments for 5 years, particularly related to engineering such as the topographical survey and hydrographic analysis of two islands located in the mouth of the Danube River which in 1856 happened to be under the Ottoman control. Around 1862, he traveled to the United States where he offered his services to the Union Army, months before the last rise of Poland against Russia in 1863. In 1863, he was discharged from the hospital to join the Artillery Regiment of Shiloh stationed at Fort Lincoln. His first mission was the improvement of 53 positions located to the north of Washington, a complex system of positions linked to each other by trenches. He developed spade works in several forts. As of March of 1864, he participated with an outstanding performance, in the offensive iniciated by Gen. Ulysses Simpson. Grant, (1822-1885), in May of 1864 against the forces of Gen. Robert Edward Lee, (1807-1870). During these operations, he directed the construction of defensive installations in Pittsburg, Virginia and participated in the blast of a strong enemy on the 30th of July. The 19th of August of that year, the army was lost and he found a position of Engineer in the coalmines of Blackmine, Pennsylvania for 8 months and soon after in the Department of Engineers of New York. In 1865, discharged from the war of the Triple Alliance, he made contact with the plenipotenciary Minister of the Argentine Republic to the government of the United States, Domingo Faustino Sarmiento, (1811-1888), who served as such during the period 1864-1868. Because he was then 33 years of age and had had 13 years of military activity, reunited antecedents of significant importance and he credited to a notable foja of services with special aptitude for specific tasks of engineers (topography, preparation of plans, construction of bridges, ways and defensive installations, etc. ), tie missions to the military intelligence and the artillery. He arrived at Buenos Aires in October of 1865, was enlisted in the Argentine Army the 5th of December with the rank of "Captain to War" in the Corps of Engineers; and assigned to the encampment of Ensenada, about 30 km to the Northeast of the capital of Corrientes, where he arrived on the 22nd of December. During this period, the allies directed their activity to the recognitions, preparation of their cash, resupplies, election of the landing point, and the preparation of the necessary material for the crossing of the water obstacle. Argentina: 24,000 men: 36 Infantry battalions (11 of Line), 33 pieces of artillery and 25 units of Cavalry. Uruguay: 2,847 men: 4 Battalions, 4 Cavalry regiments and 1 Swarm of Artillery (6 pieces). Reserve: Parked as opposed to Itapúa. 14,000 men: 6,000 of Infantry, 7,000 of cavalry and 26 pieces of artillery. Navy: Altogether the allied naval force was made up of 4 armored and 25 units of different type. The activity initiated by Chodasiewicz was intense, interesting and important their excellence and professionalism made of the confidence and affection of the most outstanding military of our Argentine and Brazilian Army deserving. The 29th of September, 1869, he married Concepción Livieres, niece of the ex- Governor de Corrientes, Evaristo Lopez, which union resulted in 6 children (4 girls and 2 boys). The 30th of April of 1870 he received the documentation of Argentine citizenship, by arrangements made in the consulate of Asuncion. He took root in Asuncion, Paraguay, where he served in the position of Director of Railroads until 1876. Shortly thereafter, he was served for 10 years in the Department of Topography of the province of Corrientes until 1887. In that province, he conducted controversial discussions on the rural property. In 1887, he sdettled in the city of Buenos Aires; the 21st of April was re-enlisted in the Argentine Army and assigned to 4ª Sección (Engineers) of the Estado General Mayor. 1º of December of 1890 he advanced to the rank of Lieutenant Colonel of the Line. He was professor in the School of Military engineers. He dedicated his time to establishing links with his compatriots of the Polish colective and to encourage activities of a social nature. The 23rd of January of 1890, on the occasion to commemorate the anniversary of the Polish insurrection of 1863; with a group of his compatriots he formed the Polish Democratic Society, destined to revive the history of that country; and to collaborate with his compatriots who arrived in the country. In 1894 he was designated temporary Director of the Powder mill. This untiring military man, 63 years of age, was retired from active service without a military pension, which left Chodasiewicz and his family in a difficult financial situation. The decorations awarded to Lieutenant Colonel Chodasiewicz for his service in the Argentine Army were the following: Use of the silver cord for his participation in Battle de Tuyutí; Metal shield for the assault on the trenches of Curupahey; Medal for the termination of the War, theCruz de Bronce, (Bronze Cross), and the Orden Imperial de la Rosa, (Imperial Order of the Rose), both granted by the government of Brazil. 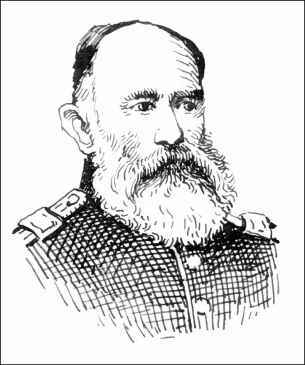 Lieutenant colonel Chodasiewicz passed away in the city of Buenos Aires August 17, 1896. 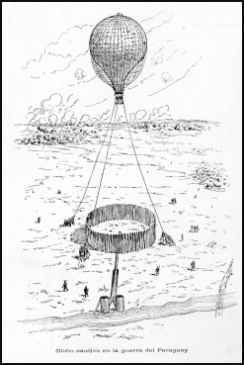 In this fight, the conquest of the air with military aims in South America was iniciated by means of observation balloons and Chodasiewicz contacted the Brazilian armed forces in order to obtain suitable equipment to that end. After some unsuccesful attempts made in 1866, the government of Brazil initiated arrangements with North American aeronaut Thaddeus Sobieski Constantine Lowe, (1832-1913), to acquire balloons and to contract for specialized personnel to carry out operations of air observation in the War of the Triple Alliance. After analyzing the different proposals from professor Lowe, the government of Brazil acquired two balloons, (one large and the other small), and equipment for hydrogen gas production. Finally the two balloons were purchased, with envelopes of varnished fabric cotton, and the necessary equipment for their inflation. In order to instruct the allied officials, on the advice of Lowe, the James and Ezra S. Allen brothers were hired. In that then, the allied observation was circumscribed to an unexpected discontinuous line of mangrullos of about 15 meters of height or to the contact between trenches of the outposts; in both cases the troops saw themselves permanently exposed within the Paraguayan weapon range. Summary of the biographical book prepared by the author. Bernardine Peitraszek This very comprehensive revue of the history of Poles in Latin America offers the following brief resumé of the life and career of Chodasiewicz. "Argentine history also recounts the story of one called Robert Chodasiewicz, who fought in the Polish uprisings of the 1840's, was sent to Siberia, received the British Crimean Medal, fought with Grant in the United States Civil War and then relocated to Argentina where he became "Primer Aviador" (the first Argentine flier-balloonist)." You can access the page by clicking on the title above. If time permits, I suggest that you sample at least some of the other very interesting stories on the site.